Atlanta, GA – Consumer Investigative Reporter and CEO, Dale Cardwell, of TrustDale, announced today the selection of Peachtree ENT Center as the newest recommended provider for physicians. This announcement marks Peachtree ENT Center official status as TrustDale Certified. 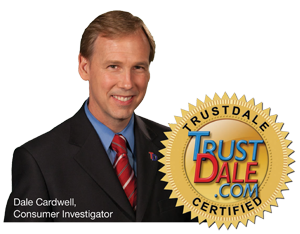 The TrustDale Certification process requires prospective businesses to pass Dale’s stringent 7-point investigative review of reputation, price, quality, and customer service. After completing this objective vetting process, the business is approved to join a select group recommended to consumers through the online business referral source, TrustDale.com. Peachtree ENT Center successfully passed their recent review and completed the certification process. The final step was acceptance of the TrustDale Make It Right Guarantee. The guarantee demonstrates Peachtree ENT Center commitment to practicing the highest standards of customer service. TrustDale is a consumer advocacy, business review, and referral company. Headquartered in Atlanta, Georgia, TrustDale is led by six-time, Emmy Award-winning, Consumer Investigator, Dale Cardwell. The company’s mission is empowering consumers throughout the Southeast with researched solutions and the recommendation of top-performing companies. TrustDale’s multi-media platform includes TrustDale.com, TrustDale TV, and TrustDale Radio. More information about the company can be found at www.TrustDale.com.